Globe Telecom recently raised P10 billion from the issuance of 20 million Series A Non-Voting Perpetual Preferred shares with a subscription price of P500 per share. 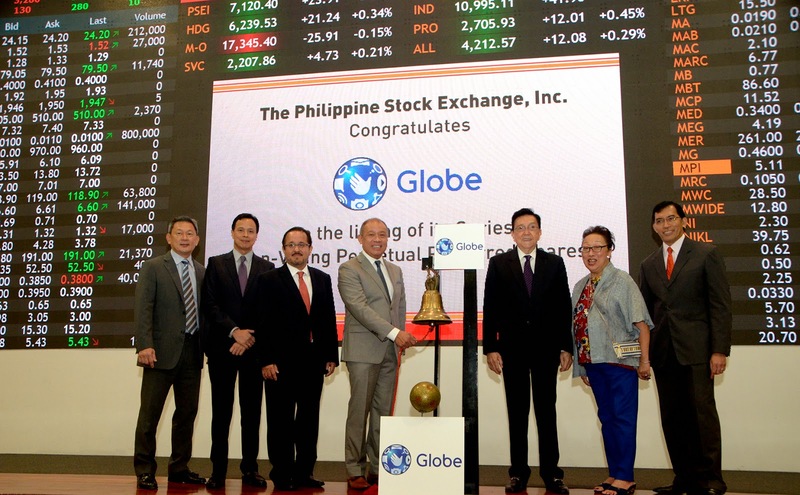 The shares were listed on August 22 at the Philippine Stock Exchange, with Globe President & CEO Ernest Cu ringing the ceremonial bell to start the day’s trading. PSE Chairman Jose Pardo said the oversubscription option testifies to the degree of investor confidence in the company’s future. Pardo further noted Globe provides the fastest Internet service in the country, citing a report by OpenSignal which crowdsources cellphone signal strength. The P10 billion proceeds will largely go towards capacitizing the Globe network to meet the growing data requirements in the country, according to Globe Chief Finance Officer Albert de Larrazabal, who emphasized that data will be a key driver of growth for the company. Specifically, about 90% of the proceeds will be used for the expansion of the company’s rollout of LTE (long-term evolution) technology to meeting growing demand for bandwidth. Globe Telecom is the first telecommunications company in the country to achieve 100% 3G coverage for its entire network, providing its customers with high-speed wireless internet service. By the end of the third quarter, 100% of its network will be equipped with the more advanced 4G HSPA+ technology.